The book presents the principles of Damage Mechanics along with the latest research findings. Both isotropic and anisotropic damage mechanisms are presented. Various damage models are presented coupled with elastic and elasto-plastic behavior. The book includes two chapters that are solely dedicated to experimental investigations conducted by the authors. 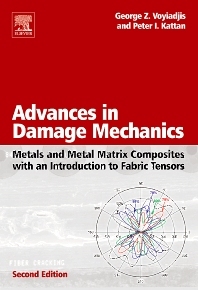 In its last chapter, the book presents experimental data for damage in composite materials that appear in the literature for the first time. Researchers in Engineering, Mechanics, Mechanical Engineering, Civil Engineering and Materials Science. Also suitable for Graduate Students in Engineering Mechanics, Mechanical Engineering, Civil Engineering and Materials Science. Peter I. Kattan has a PhD in Civil Engineering from Louisiana State University. He has written three books on damage mechanics, one book on finite elements, and one book on composite materials. His research work is currently focused on damage mechanics with fabric tensors and the physical characterization of micro-crack distributions and their evolution. He has published extensively on the theory of plates and shells, constitutive modelling of inelastic materials and damage mechanics. He is currently a Visiting Professor at Louisiana State University in Baton Rouge, Louisiana. Louisiana State University, College of Engineering, Baton Rouge, U.S.A.